Do you ever wonder if there are ways you can make your hardwood floor last longer? How about how you can save money by not having to refinish the floors in your home? There are several hardwood floor hacks that we believe every homeowner should know. These are simple hacks that will keep your floors looking great and lasting a long time. We made a list of the top 5 floor hacks you should know. When you’re done reading this blog, you’ll have every visitor at your home wondering how you got your floors to look so good! What some people don’t know is that you can get rid of floor scuffs with a magic eraser. Nobody wants black streaks on their beautiful hardwood floors. Use a magic eraser to scrub away those scuffs. You can also fix scratches on your floors by mixing together vinegar and canola oil. Then, you can take the mixture and buff it into your floor. You’ll be able to see a difference almost instantly. Are you moving your furniture around a lot? Does it make you worry that you’re scratching up your hardwood floor? The best way to protect your hardwood floors from your furniture is to place cork on the furniture legs. You can use old wine corks and cut them into thin pads. You can also use the cork to stabilize any wobbly furniture you might have. If you find yourself constantly creaking when you’re walking down the hall of your home, then we’ve got the perfect hack for you! Try giving the cracks of your floor a nice dusting of baby powder. You can use a paintbrush to make sure the powder goes into the cracks of the flooring. Once the powder goes into the cracks you can sweep up any excess powder that didn’t make its way in. Voila! No more creaky hardwood floors anymore. Do you want shiny floors without using all those harsh chemicals? Get your DIY on how to start making your own floor cleaner. It sounds like it could be complicated, but it is definitely very easy to do. In fact, you can make your own cleaner with everyday household items like vinegar, olive oil and tea bags. Your floors will be looking shiny and brand new in no time! For some people, there might be a cleaning tool that they feel works best for them. The most important thing is to find your routine and stick to it. We think microfiber dusters are really the way to go for hardwood floors. This is one of the best hardwood floor hacks because it is just a simple tool that will make a world of difference for your flooring. Try one out and you’ll never go back to a plain broom again. Did you know any of these hardwood floor hacks? These hacks are a great way to take care of your hardwood floors. 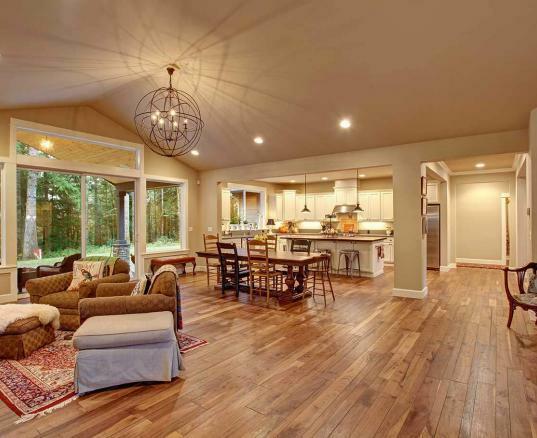 Check out our prefinished solid hardwood flooring options to see what works best in your home.